One of the 108 holy abode of Lord Vishnu, Varadaraja Perumal Temple is an important pilgrim center for Vaishnavites. It is believed that all 12 Vaishnavite saint poets (12 Alwars) visited this temple in ancient times. During 1st century Pallava King had established the temple. Later in 14th century Chola King added one more Gopuram and wall. Sprawling across 23 acres of land, the temple has three main enclosures namely Alwar Prakaram, Madai Palli Prakaram, and Thiru Malai Prakaram. 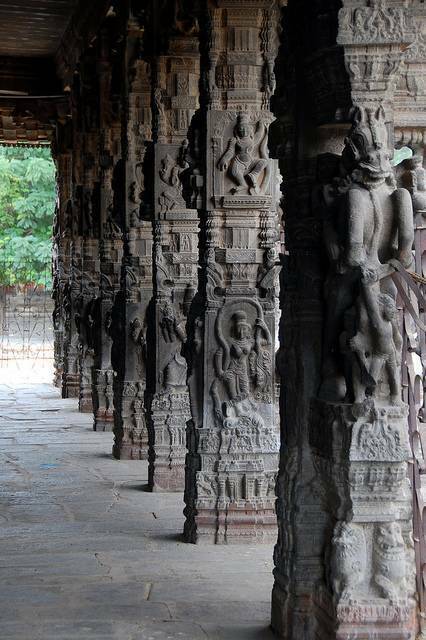 The hall with 100 pillars with sculptures from Ramayana and Mahabharata Epics is an extravaganza masterpiece of Vijayanagar Architecture. On the ceiling over sanctum, tourists can see beautifully carved and gold plated Lizards. As per Hindu Mythology, Indra, the King of Devas installed these lizards as they witnessed the ordeal of revelation from curse with the help of Goddess Saraswathi. Tourists must worship the “Perundevi Thayar” Shrine in outer enclosure before worshipping Varadaraja Perumal Deity. Various sub shrines, enormous sculptures, exquisite carvings etc. of this temple will attracts its visitors again and again. Also don’t forget to taste some slurping delicacies prepared in the Madapalli (Kitchen) of this temple which is offered as Prasadam to devotees.